A photon’s frame of spacetime — no rest for the massless – Physics says what? I’ve thought about this question for years. A FAQ. Imagine you’re traveling at the speed of light. Well, physics says that’s impossible. Mass’ gotcha. So, what can travel at the speed of light? Photons (not just the visible ones). So, imagine … does a photon “experience” space and time? Some weeks ago I recall reading that photons do not connect with space or time. Maybe some other term than “connect.” Perhaps something written by Carlo Rovelli, but I cannot find the citation. Anyway, so I reacted when I ran across a Forbes article by Ethan Siegel  titled “Ask Ethan: How Does A Photon Experience The Universe?“ (December 22, 2018). There’s a lot written on this topic (and likely covered in physics classes as well). Siegel’s article is a good summary of the material. … relativity declares that the laws of physics are the same and invariant for all observers, regardless of their motion. So what does this mean for a photon, which itself moves at the speed of light? Let’s imagine what happens in three cases: for someone at rest, for someone moving close to the speed of light, and then that last leap, to a photon itself. Case 1: Rest frame. The everyday case. In your surroundings, objects’ shapes and colors appear “normal” and any clocks in that scene appear to be running at the same speed as your smartphone’s (although Rovelli says this is only a blurred perspective, as the speed of time varies from point to point in space ). Case 2: Relativistic frame. Typically a hypothetical case, like looking at the cityscape from inside an ultra fast railroad car. In your particular direction of motion, for things outside your frame, shapes (lengths) of objects appear contracted and clocks appear to run slower (time dilates). The color of objects directly ahead of you appear bluer and those behind you appear redder. Things move through spacetime. Basically spacetime always balances to maintain an equality: the less motion in space, the more in time; the more motion in space, the less in time. The effects on things become more and more pronounced — to an unreachable limit. Capture that with your smartphone, eh. Case 3: Photon’s frame. Imagine you’re a photon. 100% motion in space. 100% contracted. 0% in time. No time, eh. Special relativity out the window. Mathematical infinities. [All a photon] experiences are two “things” during its existence: the interaction that creates it and the interaction that destroys it. Whether there is a photon that persists after the destruction, such as via scattering or reflection, is immaterial. All that a photon experiences are those two events at the endpoints of the photon’s journey. From an inertial frame of reference, we can calculate the distance between its emission and absorption point, but not from the photon’s reference frame. We can calculate its light-travel time, from any inertial reference frame, but not from the photon’s reference frame. The problem is that the photon’s reference frame isn’t an inertial reference frame: In an inertial reference frame, there are physical laws which don’t depend on the motion of anything external to the system. Yet for a photon, the physical rules it obeys depend exclusively on everything going on external to it. You cannot calculate anything meaningful for it from the photon’s reference frame alone. … rest mass is what’s required to live in an inertial reference frame … A photon cannot see the Universe at all, because seeing requires interacting with other particles, antiparticles, or photons, and once such an interaction occurs, that photon’s journey is now over. According to any photon, its existence is instantaneous. It comes into existence with an interaction and it winks out of existence with another interaction. This could be emission from a distant star or galaxy and its arrival at your eye, and it doesn’t matter whether it’s from our own Sun or an object tens of billions of light years away. When you move at the speed of light, time ceases to pass, and your lifetime only lasts an instant. Photons do not have a rest frame. Distance is irrelevant, whether within an atom or between galaxies. Existentialism out the window, eh. Using a constant proper time reference across an event which spans space is an approximation, eh. Times are legion: a different one for every point in space. — Rovelli, Carlo. The Order of Time (p. 16). Penguin Publishing Group. Kindle Edition. Ethan Siegel is a Ph.D. astrophysicist, author, and science communicator, who professes physics and astronomy at various colleges. He has won numerous awards for science writing since 2008 for his blog, Starts With A Bang, including the award for best science blog by the Institute of Physics. His two books, Treknology: The Science of Star Trek from Tricorders to Warp Drive, Beyond the Galaxy: How humanity looked beyond our Milky Way and discovered the entire Universe, are available for purchase at Amazon. 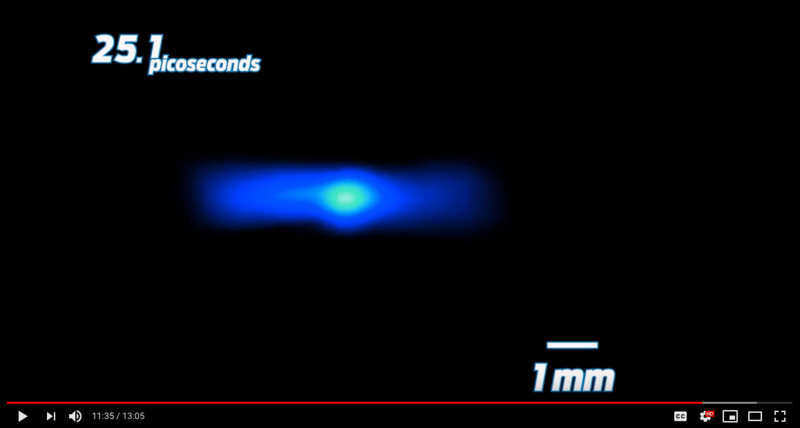 Here’s an interesting take on the speed of light, in an unexpected place: Business Insider, “The speed of light is torturously slow, and these 3 simple animations by a scientist at NASA prove it” (January 17, 2019). I’m always glad to see visualization used in communicating science. … light speed can be frustratingly slow if you’re trying to communicate with or reach other planets, especially any worlds beyond our solar system. Check out the videos of his animations. Tick-tock, ping-pong. And here’s another Space.com article by Paul Sutter on the topic: “Does Light Experience Time? And Other Riddles” (March 16, 2019). In order to ask the question, “How does light experience time?” you have to put yourself in a frame of reference that rides along with a beam of light. But in that frame of reference, light would appear to be stationary to you. That’s not allowed by our laws of physics. So there is no such frame of reference that rides along with light. And with no frame of reference, special relativity breaks down. And with no special relativity, you have no way of gauging the relationship between space and time. The end result of all this twisting? It’s not so much that light doesn’t experience time. It’s that our very concept of time doesn’t even apply to light. Light doesn’t even know what time is.